Method:1st: Melt the butter and set aside to cool.2nd: Crush the gingernut biscuits as you wish (food processor or rolling pin). Mix the melted butter and the gingernut rubble together and add a good drizzle of ginger syrup too. Mix well and press the mixture into a spring form tin. Chill for approx 1hr. 3rd: Whip the double cream and incorporate into the 400g of cream cheese. 4th: Chop up the pieces of stem ginger and mix into the creamy, cheesy mixture along with more ginger syrup. Pour over the biscuit base and chill until firm. 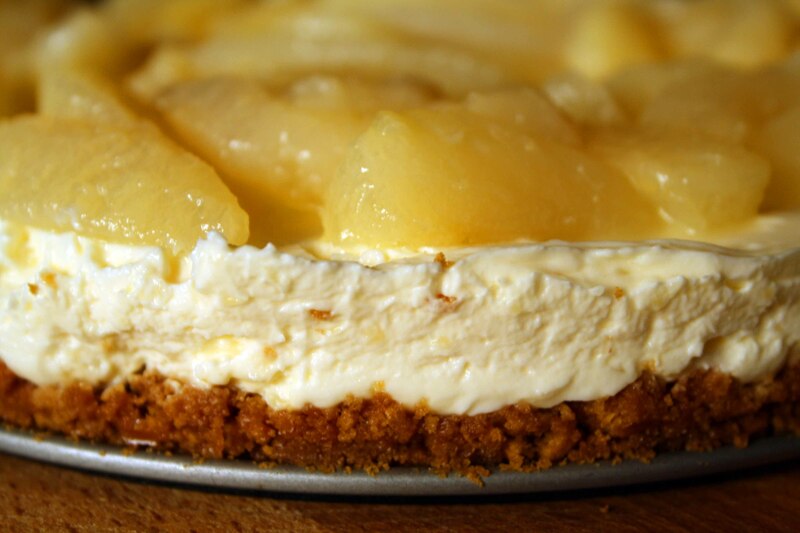 5th: I chose to top my cheesecake with pears poached in their own syrup, with a trickle of ginger syrup and star anise. I have seen this recipe done before with stem ginger and syrup on top but I do feel that that would make this teeth-achingly-sweet. I would recommend that you choose some form of seasonal fruit to go on top of the cheesecake. I chose pears as their flavour would complement the gingernut base and they retain some of their shape when gently poached. The River Cottage makes one with poached rhubarb but not everyone is a fan. Poached plums would make this a great autumnal dessert. Great for afternoon tea but could just as easily be a delicious dinner party dessert, served in individual ramekins or prepared in metal rings ready for plating up. A super easy cheesecake to make and even easier to eat! I can’t wait to have to make it again. Give it a go and let me know what fruit choices worked for you. As much as I enjoy the kitchen with both its discipline and creativity combined, there really are times when the idea of cooking for one can be more of a chore than a pleasure. The thought of having wanting to create something comforting, wholesome and packed with flavour stirs images of the washing up taking longer than it does to eat! “Pasta and sauce, rice and a can of tuna, soup, cheese toastie!” I hear you yell student staples at me. “As if were that difficult! ?” I hear you mock me. But there are ways round this without having to reach for the jar of tomato sauce everytime. Generally I find that if I want a simple, easy, one-off meal, packed with flavour and comforting AND minimises the washing up, cheese becomes my ingredient of choice. Now I know that there are a multitude of cheeses which would naturally result in a greater multitude of cheese dishes. However, I’m not talking about having to make complex cheese sauces nor am I talking about a cheese and crackers! I’m talking about the simplicity and speed of heated or melted cheese. No recipe to follow, just your judgement as to how much you want to use. The point of heating cheese is simply to allow it to soften and ooze until it becomes a liquid permanently on the cusp of becoming solid again. Normally used as a glue to ensure that the rest of the filling does not spill out – melted cheese is a delicious meal when encased in pastry or between slices of bread. Place a tortilla into a frying pan large enough in diameter. Grate whichever hard cheese or combination of cheeses you wish to cover the tortilla (leave a 2cm rim around the edge). Chop spring onions and a few slices of chorizo or pepperoni over. Sprinkle over some dried chilli flakes or use fresh and add oregano and basil. Season to taste. Grate some more cheese over and cover with another tortilla. Once the cheese has melted and the base not too crispy, flip it over and heat on the other side for another minute. Allow to cool slightly before serving. ROAST GARLIC. If like me you were given a garlic roasting pot as a present this is its ideal use, a roasting tin and some foil works just as well. Give the garlic head a knock on the work surface to tease the cloves or cut the tops off and place into your garlic roasting pot and drizzle over honey, olive oil and add a bay leaf, sprig of rosemary and seasoning. Add a knob of butter and roast in the oven for 40mins at 200˚C. TOP TIP: If cooking this on a Sunday you can prepare this along with your roast, otherwise just prepare it in the evening bearing in mind to accommodate for its cooking time. 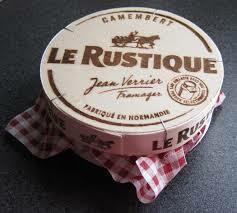 After 30mins take the Camembert from its wooden box and remove the wrapping, putting the cheese back into the box. Put a large cross on the top of the Camembert and put the lid back on the box. Cook alongside the garlic until the cheese is oozing and gooey. The garlic once roasted turns into sweet amber nuggets that need to be squeezed out of their papery cases and spread onto your bread before dunking into the hot, bubbling Camembert. Wash it all down with a classic French red. It’s best avoided to entertain anyone’s company after this!